2. Forum vs Facebook Group? Many believe that forums are dying because of social networking. Indeed, in the past, forums and message boards used to be our social media. But today, with all our Facebook, Twitter and Instagram accounts we simply forget about forum discussions. Yet they still have great worth. Believe it or not, but forums are still one of the most popular places to ask and answer questions about brands and products. Businesses use them as bespoke and more targeted, well-organized social media that they have full control over. Isn’t it great? Even if you’ve recently started working in the web building niche, you’ve certainly heard about Wix. This is a website builder, which has universal nature and recognition. It was founded in 2006 and has over 125 millions of registered users worldwide. The service allows launching websites of different types. Forums are not an exception. The service has won popularity with proficient web designers and newbies due to its ease of use, immersive web building experience it ensures, convenience, affordability, flexibility and diversity of design customization tools it offers. Several millions of websites have been built with this service already and many more are still under the development. WYSIWYG Editor. Due to this editing option, user experience doesn’t matter a lot, when it comes to forum creation. WIX ADI. Artificial Design Intelligence is a handy tool that simplifies the forum building process by automatically generating a ready made website based on the information provided. Niche Templates. 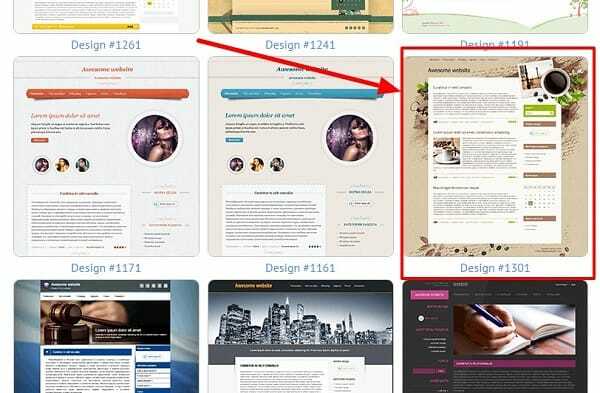 Wix offers a set of quality niche specific mobile-optimized templates that will be a perfect match for your forum. App Market. This is the place, where you can find multiple widgets to be further integrated into your forum (ChatRoom, Comments, LiveChat, Smart Chat, Form Builder, ShoutOut Mailout etc.). Wix is rich in features that will help you complete the entire forum creation process with ease and convenience. See the complete list of features in my in-depth Wix Review. In 2017, after 10 years since it’s launch Wix has enabled a forum building update. I’d wondered why there was no such option before. But now this website builder is considered to be versatile. Step 1: Register with Wix and create a website. 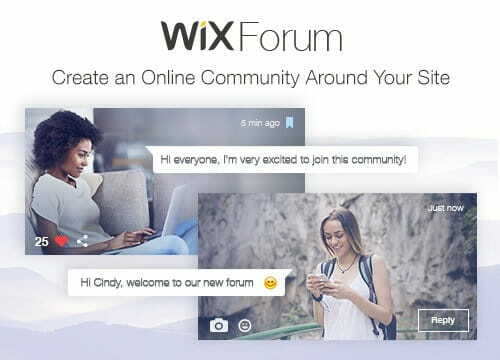 Step 2: Select Forum App from the Wix App Market. You can find it in Social App Section (it’s free). Step 3: Now you received a default forum template. As you see, Wix forum differs from standard forum view. With the block category structure and logo pictures, It looks at least modern and attractive. Step 4: Set up your forum. Wix has a lot of forum settings but they’re a compactly packed into 6 menu options. Step 5: Select a forum posts view. You can choose between ‘Cards’ view or ‘Classic’ view. 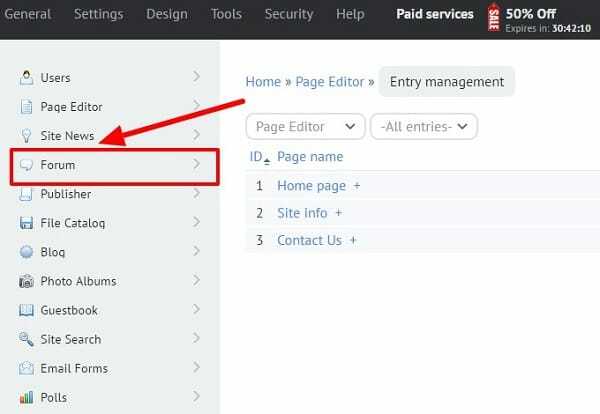 Step 6: Publish your website and your forum is live. As you see, the forum creation process is easy and quick. It doesn’t matter what web design experience you have – the tutorial will provide you with simple and understandable forum design tips. 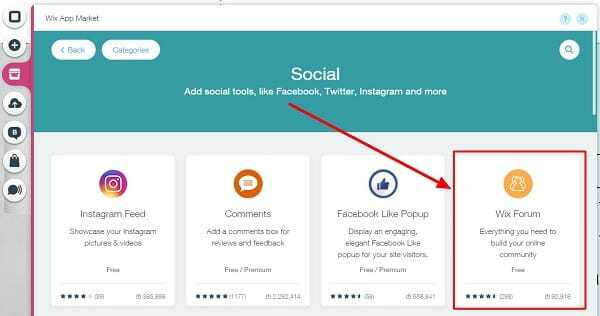 If you choose a free Wix plan, you are able to create a website on Wix subdomain only (your site URL will look like user.wix[.]com/sitename). Plus your website will contain an ad-banner. I think, you’ll agree that such URL and ads looks unpleasant. No fix that you should subscribe to one of the paid plans that start from $8.50/mo. add to the overall search engine ranking etc. Creating a complex forum is no longer a difficult task. 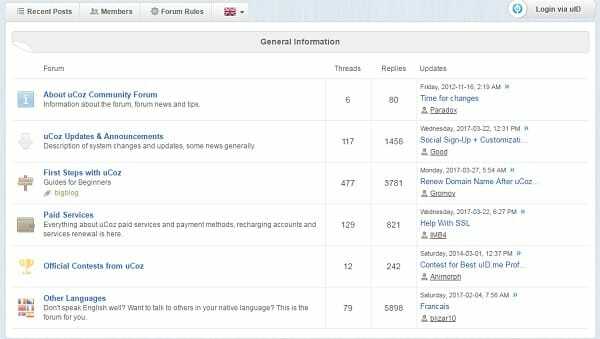 There are many DIY softwares out there that let you set up a decent forum overnight. One of these is uCoz website builder. uCoz is targeting both the end user and professionals, as it offers both DIY and advanced editing solutions. Whether you are a proficient web developer with years of niche expertise or a beginner, who is willing to start a personal or a business forum, uCoz will help you succeed with that. Forum Module. The module is free and easy to connect to the existing website. It lets you build forums with any number of sections based on the functionality required. Each forum you create comes with a set of properties like state (active or closed), rules, icons, password settings, user management options etc. You can add and edit posts here, create buttons and icons, add any number of RSS feed entries and threads per page, upload multiple files at a time etc. Advanced Security Level. The system ensures stunning protection of its servers from DDoS attacks, which boosts your forum safety level. SSL Certificate Connection. You can connect a SSL Certificate to your domain name to enhance your website safety. Opportunity to Connect a Forum to an Existing Website. 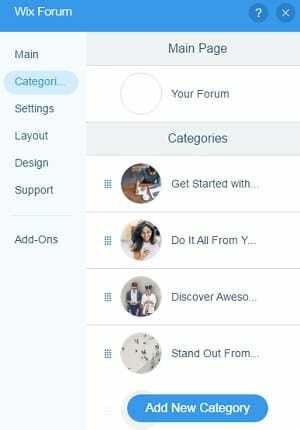 The system allows launching a separate forum website by using the forum subdomain (like forum.site.com) irrespective of a website builder or CMS a website was built with. This is very convenient, if you need a forum and don’t wish to change the platform it was launched at. Read my complete uCoz Review for more details. Register and confirm your registration. Registration is free and doesn’t require entering any billing info. Select a domain name. Here I must note that with uCoz you have three options: 1) use a subdomain (sitename.ucoz[. ]com); 2) attach a previously purchased domain; this option is available for free users, too; 3) purchase a new domain through https://domains.ucoz[.]com/. Select a template. Again, you’ll have three options. Firstly, you can go with a standard template. Secondly, you can create your own design. Thirdly, you can opt for a paid one from the official store. I would recommend that you start off with one of the free, standard templates. You can switch it anytime. The most recent free templates are all responsive, and marked as Mobile-Friendly by Google for the mobile search results. Enable Forum Module. There are 22 modules, including Mini Chat, Polls, Publisher, Blog, Site News, Tests, Ad Board, Forum and more. If you need to build a forum, it’s obvious that your core module will be Forum. However, nothing stops you from activating additional modules to extend your site’s functionality. Thus, you can add a blog, poll, ad board and even an Eshop to your forum if you so wish. The modules can be turned on and off any time. set maximum uploaded file size and more. Once you have finished adjusting the functionality, you can fine-tune your site’s look. To properly edit templates you must have a basic knowledge of CSS and HTML. The Forum module is closely connected with the Users module which is installed automatically for each website. Adjust its settings to control who can leave entries, moderate messages, upload files, create polls, remove threads etc. Once you have published the website, you can continue using it free. Pay attention to the fact that all free accounts have to display ads. In order to get rid of the advert, upgrade your website. Ad-free uCoz websites start at $5.99/mo. Building a forum with uCoz is more complicated than launching it with Wix. The platform requires a certain degree of coding skills, but this doesn’t mean that newbies cannot master it, if needed. 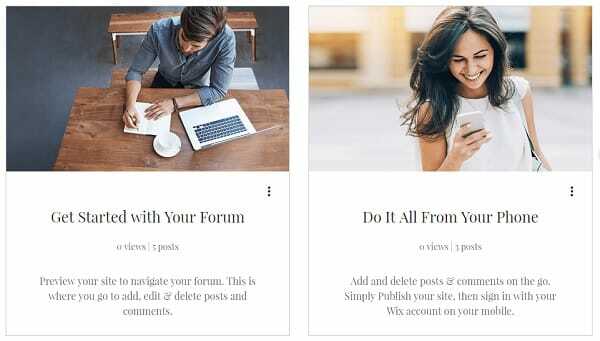 If you do everything right and invest a bit of your effort and time, the website builder will let you create full-featured forums for personal or business use. uCoz works well for launching niche forums (auto, music, female etc. ), those of gaming communities and well as local neighbourhood or city forums. This is, probably, the most complicated way to create a forum. Open-source programs are not easy to master and use. They definitely require preliminary web design expertise and it takes much more time to get a decent result here. To start building a forum with the open-source software, you’ll need to choose the one first as well as to get a domain name and hosting. 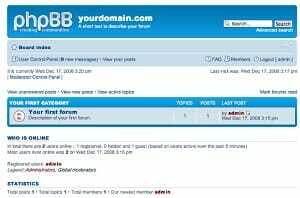 As of today, the choice of open-source programs is rather wide: there are both paid and free packages geared towards creating multi-functional forums, like phpBB or bbPress, for example. If you are a web design pro or a coding enthusiast, you might like the idea to use open-source software as a forum building tool. However, this is not the best solution anyway as these programs are not quite secure from the point of view of website safety. They also require much time to be mastered well by newbies. If you have made up your mind to launch a forum (even a big one), using open-source software doesn’t make any sense. When it comes to creating a community website, a forum has always been the first thing that comes to mind. As time goes by, though, we start observing the increasing popularity of Facebook groups. Just like forums, they mostly unite people, who share the same interests and they are also centered around a certain idea. Let’s have a look at the pros and cons of forums and Facebook Groups. Unite users, who are genuinely interested in certain content. Instant notifications about group updates. Now that you are aware of the advantages of forums and Facebook groups, it it high time to focus on their drawbacks. The need to undertake enhanced anti-spam measures as there are many users, who purposely create fake accounts for fraudulent actions. So, what’s better – a forum or a Facebook group? It’s up to you to decide that, of course, as it is you, who knows your real intentions and online community needs. Both options are popular and you can even use them at a time. However, forums are still the leaders in this comparison. They are more convenient both for users and owners. They cover a broad spectrum of topics within the same field of interest. Forums have been around for a longer time than Facebook groups. Obviously, more people have got used to them and, thus, give preference to this option more often. 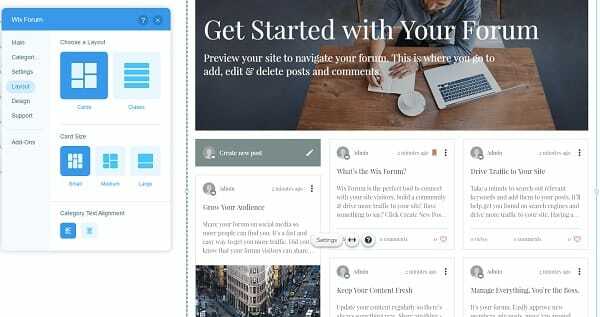 To make your forum website a success, you should initially understand that users, who join online communities, have versatile interests and goals. This is a widespread misconception that only music enthusiasts or people, who have hobbies, join online communities to find their co-thinkers there. That’s not true. Interests differ and so do forums. Custom Logo. Having launched a forum and made sure it works well, you should obligatory add your company logo to it. If you plan to use a forum for your individual purposes, think about creating your own logo and incorporate it to the forum. This will reveal the professionalism and credibility of your online community, contributing to its reputation. Additions. The prevailing amount of forums come with standard functions and features, so, the best way to give your forum personalized look is to make the additions. By adding such hacks as a journal or a store, for example, you encourage users to come back to the website again and again to enjoy these options. Unique Styles. Default forum styles may look quite boring as opposed to unique ones. Don’t overlook a possibility to create a forum style of your own. If you can’t, make use of the integrated style management feature to do that. This may take some time, but the result will be surely worth that. Unusual Offers. Keeping the existing members interested in visiting your forum is much more difficult than attracting them for the first time. With this purpose, it makes sense to organize contests and make up unusual offers that will encourage users to visit your forum. Such contests may be organized every month, for example, and you can even award the winners with encouraging prizes. This is one of the tricks that really work. Rules. There are no forums without rules and yours should not be an exception as well. This doesn’t mean, of course, that the list of rules should be too long. Instead, it should contain the most essential points each forum member should be aware of. The set of rules reveals your professional approach to business in general. Rules may differ with regard to the specialization of your forum, so, take your time to think about them in advance. Watch Out for Malignant Members. Running a forum is frequently even more complicated than launching it. This is because you have to watch out for different kinds of online frauds and malignant members, who visit your forum to gain their own purposes. If you fail to detect such elements at once, your forum reputation may be at risk. So, take active part in all forum discussions to identify the spammers and the trolls the sooner-the better and to stay aware of your forum content. Content. Your forum is all about the content it involves. “Users may visit it once or twice just for the interest, but if they don’t find something they really need there, they will hardly come back again. With so many forums available out there nowadays, finding the most suitable one is no longer a problem and your number one task tis to add only relevant and unique content that will differ from that posted by your competitors. Members. Success and popularity of most forums depend a lot upon their members. I mean, on those of them, who actively participate in forum discussions and add content that might be interesting and useful for other members. This is the essence and the basics of any successful online community. When your forum is still new, it will hardly have many members at once. That’s obvious. You can go two ways here. You can encourage your friends to post actively in it or hire someone that will do that until a forum gains popularity. There is nothing more effective than real people posting real threads in forum discussions on a regular basis. Create a Forum Video Guide. Modern forums often come with advanced features that may seem too complicated for the online community members. Search and messaging options, notifications, posting, signatures, private communication… These is the incomplete list of what members may face at your forum. Creating a forum video guide is the best way to provide your forum members with information they currently need. Participate in Forum Discussions Yourself. There is nothing more encouraging for the forum members than staying in touch with its owner. The best way to do that is to participate in everyday forum discussions on your own or even make online forum video calls and conferences. If possible, don’t overlook an opportunity to organize real meetings with your forum members from time to time. Nothing can be more efficient for users than real-time conversations with the owner, who is sincerely interested in the development of the online community. Offer Your Regular Visitors Special Ranks. As time goes by, there will be users, who will remain enthusiastic about your forum and will become its regular visitors. They will participate in everyday discussions, thus initiating forum communication and keeping it alive. If there are such members at your forum already, it definitely makes sense to offer them special ranks to encourage active forum participation in future. This is how you can reward their dedication and recognize them within the entire online community. Forums are still part of the social media sphere and should be used as a way to create strong communities and bringing existing communities together. Despite constantly growing social networks, forums aren’t just a spare tyre. It seems every site builder has a forum. Forums aren’t dead.